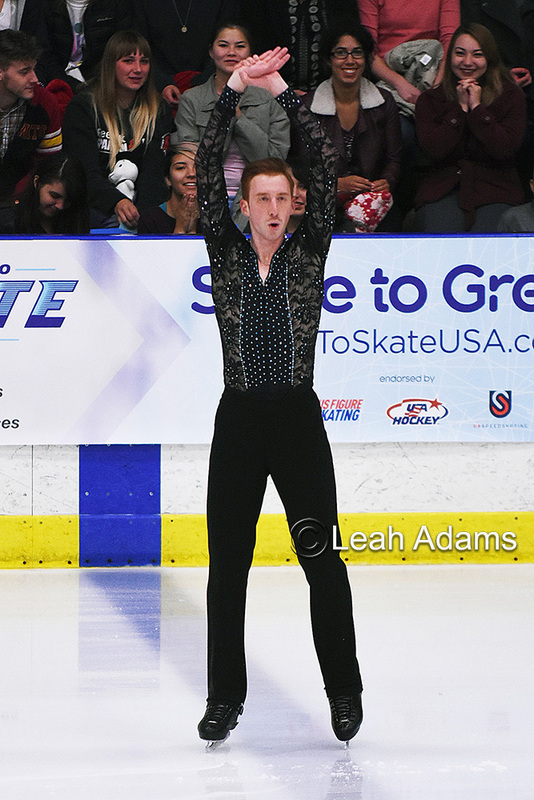 Sean Rabbitt didn’t win a medal Friday at the U.S. International Figure Skating Classic in Salt Lake City, but he certainly won the hearts of the crowd. Performing a free skate to a mambo medley by Perez Prado, Rabbitt had the audience fully engaged with his program from start to finish — despite lacking any big quadruple jumps. Rabbitt earned one of the biggest crowd ovations of the entire competition and placed 8th in the men’s event. Cloutier, who was in Salt Lake City covering the event for Figure Skaters Online, spoke with Rabbitt briefly after his free skate about his performance. Figure Skaters Online (FSO): Great free skate tonight, Sean. The crowd loved it. Sean Rabbitt (SR): Yes, it was crazy! Wow. FSO: Were you happy with how the program went? SR: Yes, I was. You know, it’s always tough to compete at elevation. (Salt Lake City is 4226 feet above sea level.) It adds a whole other set of nerves, but I think it worked to my advantage that I’ve competed here multiple times. ( Rabbitt placed 7th at last year’s U.S. International Figure Skating Classic event in Salt Lake City.) The crowd also helped to just take away those nerves and push me. So that was a great time (tonight). FSO: Is it a conscious decision on your part to try to bring some more entertainment value into competitive skating programs? SR: It is. I know that artistry is my strength. And I know that, if I can really get the crowd into what I’m doing, then hopefully the judges will like it even more. So as long as I get the technical side done, usually I can balance out in what I’m lacking, or not as strong in. Artistry is my strong point; so I try to choose things that are going to engage the crowd. FSO: You went for your hardest element, the triple Axel, in the free skate. How is the triple Axel going right now in practice? SR: You know, recently, it’s probably the best in training that it’s ever been, in my whole life. It’s still just figuring out the equation, as to what is working in practice, that I can bring into competition. So, I’m working it. It’s been really good, and you should plan on seeing it this year. Consistently. FSO: What are your goals for this fall season? SR: I want to make the triple Axel more consistent. I also would like to work on more execution on all my elements. Getting more pluses (in grades of execution, or GOE). Bringing the +1s and +2s up to +2s and +3s. So, again, anything that I might be lacking technically, I can hopefully raise that up with the added components and execution scores.